An Apostolic father of faith to the nations, Dr. George was the Founder and Senior Pastor of the LORD’S FAMILY CHURCH in 1982 - 2001. He was also a member of the LOVE SINGAPORE leadership team (1995 - 2001). Since 2001, he has undertaken the next level of his calling to serve the nation of Israel. Dr. George has received several commendations from the Israeli Knesset for his many services rendered to different groups within Israel under the banner of SHALOM ISRAEL (ASIA PACIFIC). 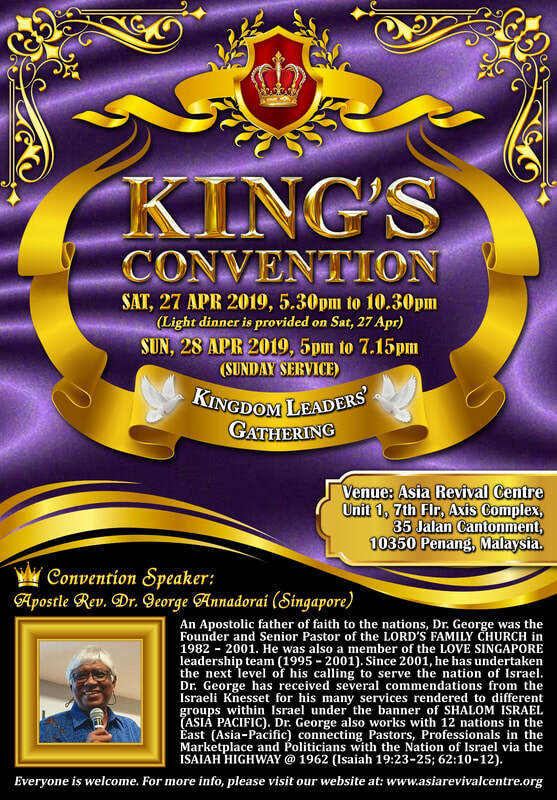 Dr. George also works with 12 nations in the East (Asia-Pacific) connecting Pastors, Professionals in the Marketplace and Politicians with the Nation of Israel via the ISAIAH HIGHWAY @ 1962 (Isaiah 19:23-25; 62:10-12).